I’ve only just gotten into trying Asian sunscreens this summer (I dipped my toe in with Shiseido Ultra Sun Protection Cream and Innisfree UV Perfect UV Protection Cream Triple Care, and have Missha All Around Safe Block sitting in my queue), and so far the Innisfree is doing very well, indeed. Recently, I also received the new Benton Papaya-D Sun Cream in exchange for an honest review, and was delighted to test it out! Surely it’s Cate’s skin we’re all coveting, and not Brad’s? 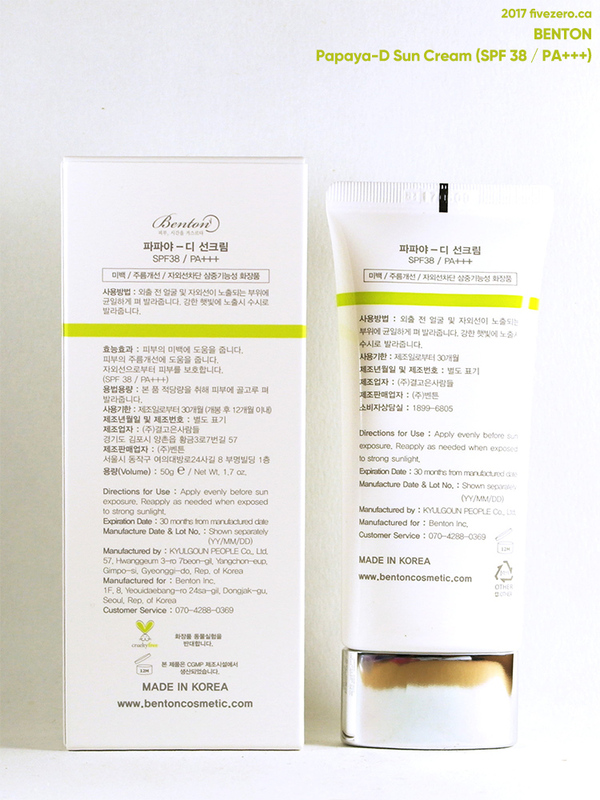 Benton is one of the smaller Korean brands—as it isn’t owned by one of the major conglomerates—and it is cruelty-free. Their main selling point is the use of natural ingredients and the freshness of their products due to Benton’s small-batch production. The Papaya-D Sun Cream I received marks Benton’s first foray into suncare. 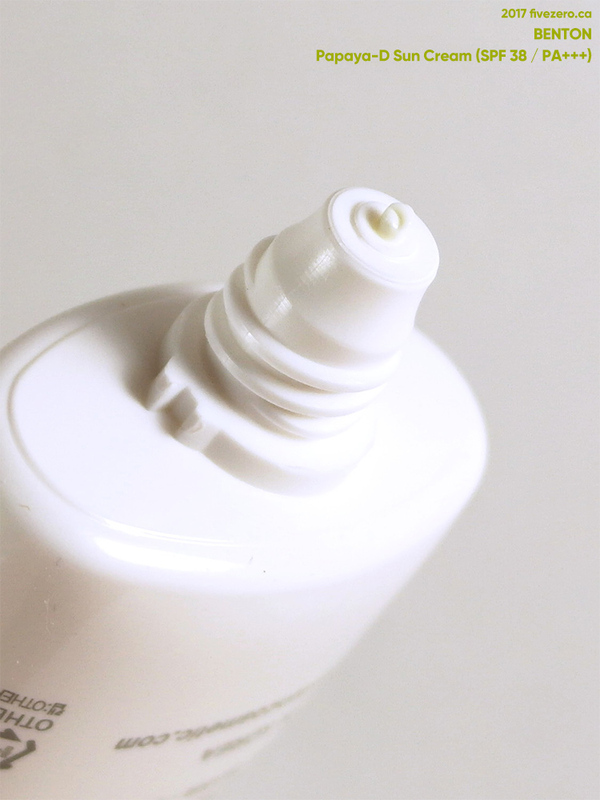 It is a combination chemical-physical sunscreen: in order on ingredient list: titanium dioxide, ethylhexyl methoxycinnamate (octinoxate), isoamyl p-methoxycinnamate (amiloxate), and bis-ethylhexyloxyphenol methoxyphenyl triazine (bemotrizinol/Tinosorb S). Of the sunscreen ingredients, amiloxate and Tinosorb S are EU-approved and undergoing regulatory evaluation in the US. Benton is currently in the process of releasing a second, physical sunscreen containing titanium dioxide and zinc oxide. Other beneficial ingredients include papaya fruit water and papaya fruit extract, which contain vitamins, polyphenols, minerals, and papain. Papaya seed oil helps to keep the skin to retain moisture. Niacinamide and adenosine work to brighten the complexion and smooth the skin. The product aims to not only protect the skin from UV damage and other external stressors, but also to moisturize and improve the complexion at the same time. The sun protection of this product is rated at SPF 38 / PA+++, which means it blocks over 97% of UVB rays (30 blocks 97%, 50 blocks 98%, 100 blocks 99%). I personally like to use SPF 50 on my face, so while SPF 38 is fine and I will readily use it, I’d prefer it to be a little higher and would choose a different sunscreen based on this (I mean, it barely costs more between SPF 30 and SPF 50, right?). 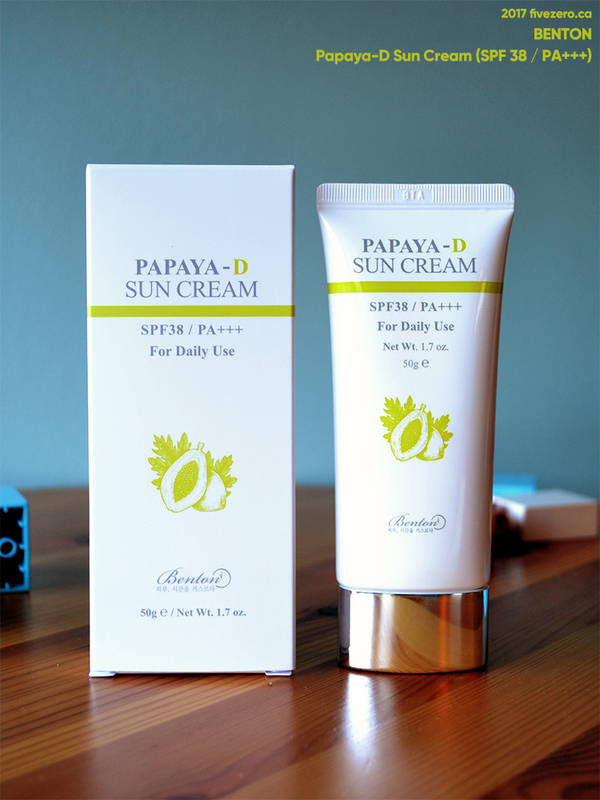 However, SPF does not refer to UVA protection, which is the main cause of deeper skin damage. European and Asian sunscreens tend to offer better broad spectrum protection against UVA than US sunscreens, due to the FDA’s restrictions on certain sunscreen ingredients. Physical sunscreens like titanium dioxide, present in Benton’s product, provide UVA protection (zinc oxide provides more). The product has a gentle citrus scent due to the small amount of citrus oils (lime and lemon) at the end of the ingredient list. It also contains papaya water, seed oil and extract, jojoba (Simmondsia chinensis) oil, juniper fruit oil, and safflower oil. I didn’t have any issues with irritation, but those who are more sensitive may wish to avoid this sunscreen. 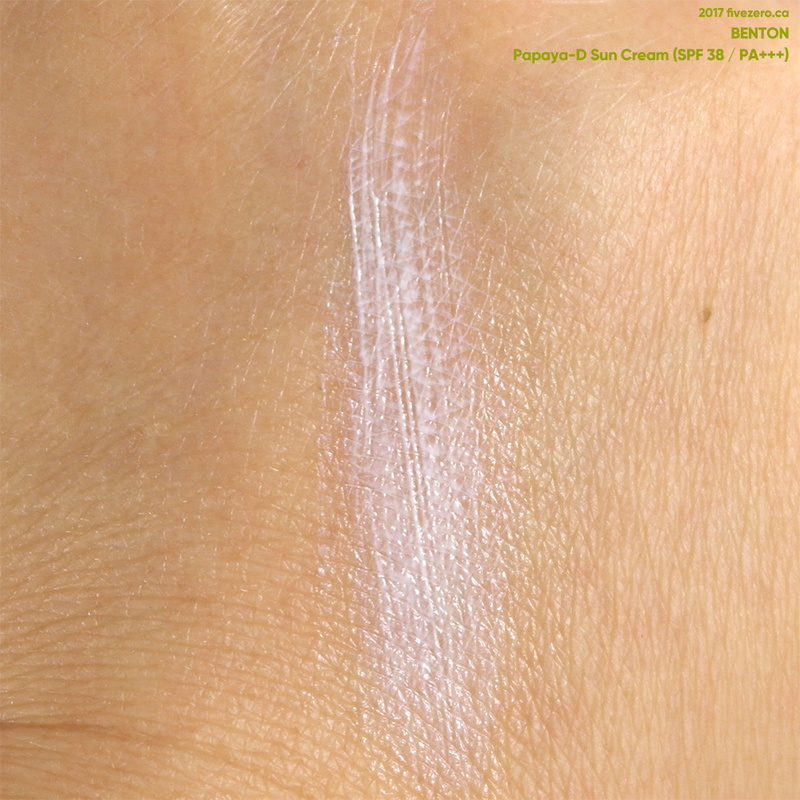 The texture is a light, moist-feeling cream which applies a bit white on the skin, at first. After being rubbed in, it leaves a white sheen, but I also find that after a few minutes, this mostly disappears. I also wear foundation over my sunscreen, so a subtle white cast in sunscreens never bothers me much. My skin is on the dry side, and it seems to appreciate the moisturizing effect that this sunscreen also has. I’m not sure how well this would play on oilier skins, but for me, it’s a bonus! It feels fairly light over my skin, and it’s played well with the other products I’ve used with it. I’ve worn this sunscreen over lighter face products: I’ve found my skin gets unhappy in the summer when I use too much product—sorry, The Ordinary and COSRX, back on the shelf!—so I’ve simply been using a Korean emulsion (Mamonde Moisture Ceramide Skin Softener) and/or a light moisturizer (Valcena Nutri-Lift Sérum) during the day. The sunscreen plays well with the foundations I’ve used over it (The Ordinary Serum Foundation, The Ordinary Coverage Foundation, and tarte Empowered Hybrid Gel Foundation). This product has worked well for me—just as well as the Innisfree UV Perfect UV Protection Cream Triple Care SPF 50 / PA+++ that I was using before. The main benefit of the Benton has been the fact that I find it more moisturizing. Overall, I’m quite pleased with this sun cream and definitely look forward to trying Benton’s second sunscreen, as well! I hope the online retailers stock it, soon. [I received this product complimentary in exchange for an honest review. 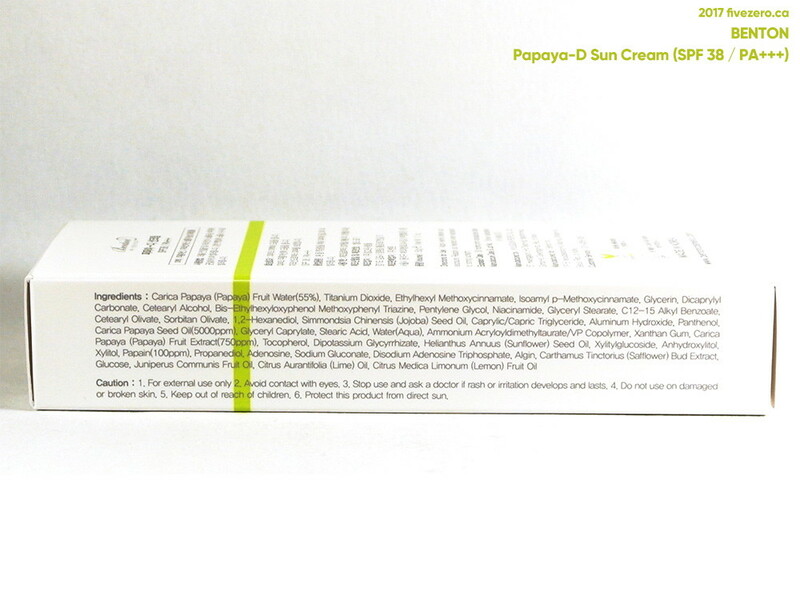 Benton — Papaya-D Sun Cream (SPF38 / PA+++) contains 1.7 oz / 50 g and retails for US$14.66–$20 (at various Korean e-tailers). Benton was launched in 2011 by South Korean brothers JangWon and ChaeWon Lee. The company name is a sort of portmanteau of “Benjamin Button“, an F. Scott Fitzgerald character who ages in reverse. Benton is based in Seoul, South Korea. Ooo, I did not know that about UVA protection and SPF! An even better motivator to find good physical sunscreens. Looking at the ingredient list, it does not look like it should be bad for oily skin! I might have to give this a try. Neat that it’s both chemical and physical – seems like this is becoming more popular. Get your bases covered, right? I only know Benton from their snail gel – glad this is working well for you! Sounds like an interesting product! The biggest issue I have with wearing suncreens under foundation is they make me greasy about halfway through the day which is super annoying. Nice review! I was afraid the Titanium Dioxide will give a white cast and it seems to do it 😦 Nice to know it’s moisturizing so I hope it doesn’t feel like a heavy coating in the humidity!